The modern apartment has 51 m² is on the 1st floor. and consists of a living / dining room and kitchen in which there is a sofa bed for 2 persons is located, 1 bedroom, 1 bathroom, air conditioning, satellite / TV, balcony with sea view and parking. Living area: living / dining room and kitchen are in one room, sofa bed for two persons, with balcony, with sea view, laminate, satellite TV. Kitchen Description: Kitchen, dishes available, kitchen towels, electric cooker, cooking rings: 4, oven, refrigerator with freezer, coffee machine. Bedroom: double room with double bed, balcony, sea view, laminate. Bathroom / WC: Bathroom with toilet, with shower. 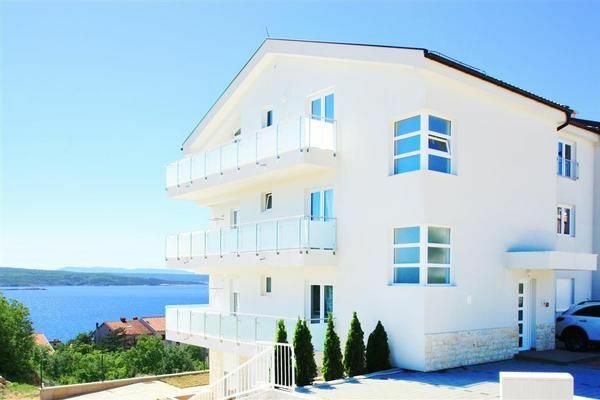 Balcony / Terrace: private balcony, with sea views, seating available, Balcony Size: 14 sqm. Miscellaneous: grilling not allowed, Parking on the property, no pets, air included in price, owner lives in the same house, bed linen available, towels available, laundry with the landlord for a fee. Registration fee: once per person Costs amounting to 4 EUR (Mandatory). Washmashine usage (per wash): per object and day Costs amounting to 5 EUR (optional). Visitor's tax: per person and day Costs amounting to 1.3 EUR (Mandatory). Parking facilities (per property and day, included in price 0 EUR). Washmashine usage (per wash) (per property and day, included in price 5 EUR).